to separate the useful information from noise. Recordings on phonograph cylinders are characterized by high noise levels due to mechanical surface damage, sticking of dust, and destruction of the surface by microorganisms. Damage by microorganisms and repeated sound reproduction by methods which employ a high pressure on the cylinder cause the greatest harm to the information carrying surface. The basic distinctive feature of the method developed and researched by us is that the sound track profile is read from the cylinder, then digitally recorded in a computer and converted into sound after appropriate processing (operations of differentiation and transposition of the signal spectrum from one frequency range to another). This method has a number of advantages. 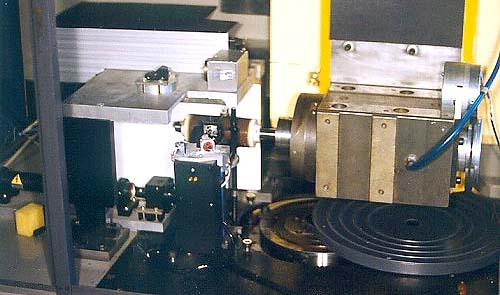 Recording of the groove profile is carried out at speeds 10-20 times lower than the ones at which the sound was once recorded. It's possible to reduce the system dynamic load on the cylinder surface by 100-400 times compared to traditional methods by slowing the cylinder rotation to 10-20 rpm. 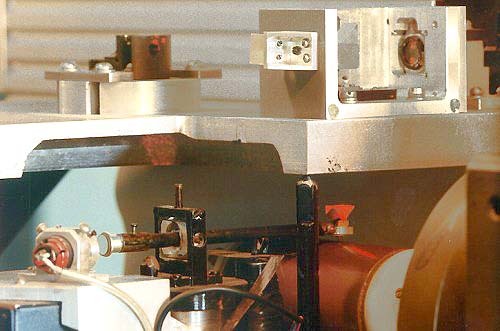 As a system for groove profile readout there was developed and researched a combined optomechanical interferometric system constructed on the classical scheme of the Michelson interferometer. The groove profile of the cylinder is followed by an elliptical stylus. The prism, the optical element of the interferometer's measuring arm, is stiffly connected to the stylus. The interferometer part of the player. Laser light comes in from top right, is deflected by a beamsplitter and continues to the detector at top left as well as to the prism on the stylus glowing red below. From the stylus the beam is reflected back to the beamsplitter and continues to the detector. The movement of the interferometer arm following the sound track profile is measured with a precision of 0.08 µ and is recorded in the computer. For sound reproduction the derivative velocity of surface profile measurement is calculated and and computer processed. Through the computer the reproduction speed is programmed with respect to the rotation velocity at which the recording was made. The precise rotation velocity at which recording was carried out is unknown for most cylinders. The cylinders rotate at a constant velocity of about 12 rpm. The longitudinal velocity of the cylinder movement is controlled by a control system which maintains the head of the tone arm at right angles to the groove of the phonograph cylinder with a given precision. The sound track profile is read by an elliptical stylus connected with the mobile prism of the interferometer. Stylus pressure is no more than 2 grams. While developing a node of the interferometer mobile prism the main attention was paid to reduction of the mobile block mass. Tone curve obtained from the optomechanical player. The stylus with the interferometer prism mounted on top. The optical signals appropriate to the sound track profile are produced in the interferometer by interference of rays reflected from the mobile reflector connected with the cylinder surface and from the fixed one. Above is shown an example of real interferential signals obtained from a phonograph cylinder. The developed device allows reproduction in the frequency band up to 20 kHz, considerably in excess of the frequency spectrum recorded on the phonograph cylinder. The Petrov player has been used to transfer a collection of wax cylinders with Jewish music from the Vernadsky National Library of the Ukraine, which has been released on CD.